Jungle Room Sessions on the legacy label. A 2-CD version with original master on CD-1 and outtakes on CD-2. CD-1 adds nothing too what we already have. CD-2 contains previously released outtakes, but this time remixed by Matt Ross-Spang at Sam Phillips Recording in Memphis, Tennessee. Most likely the producers ambition was to add more than just noise and echo. However, these two elements are most prominent, and makes the legacy edition a strange choice of options to revitalize these sessions. If you listen to 'Bitter They Are, Harder They Fall', both take 3 and 4 (false starts) comes in brilliant sound. It is so clear that we can even hear the telephone ringing. But, when the full take (take 1) starts, so does the echo. It is suddenly there...and destroying what otherwise could have been very good. This echo has been added to all tracks, but some is less prominent. The worst examples are both takes of 'For The Heart'. Both first takes of accoustic guitar- and electric guitar version respectively. There as a few words of studio banter not heard before on this album. Even that is a strange choice, because it features Elvis putting down John Wilkinson. Was this necessary to add? In general CD-2 has a lot of banter between Elvis and musicians. I would say too much on a mainstream CD. 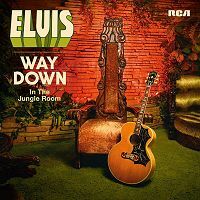 I was hoping for a project more like Elvis At Stax, but Way Down In The Jungle Room is not even close. And that due to post production!